I guess it’s official now. Our divorce, that is. I should have seen it coming, but I honestly thought that we would be together forever. I’d never had eyes for another. You had always been my plan for the future, and I eagerly moved to you without considering my other options, as young folks often do. You were gorgeous. You were popular. I wanted you. For four years, we lived in bliss. You taught, and I lapped up what you offered. There’s no meme of a happy puppy licking an ice cube that would come close to the reverence that I gave to you. I lived, ate, drank, and breathed you – even when you smelled like a literal pit. But we separated. We had our four years, and our time was up. I know that it’s your typical timeline, but I couldn’t break away from you. I tried to do the distance thing, and, to my (12) credit(s), you were pretty receptive. It wasn’t enough, though. I was drawn back to you. I came to you nearly every day for a year. I gave you tears (so much stress), sweat (consider AC, for the love of all those who forget their deodorant), and blood (I’m clumsy, okay? ), but then you were done with me. Whenever you wanted money, I gave it to you. I didn’t question why you needed it; I knew that our time together would end if I didn’t do as you say, so I drained bank accounts and made it work. In return, you gave me two lovely pieces of paper, and you may have even paid for the stamps to mail them to me. Appearances are important to you and you do try to seem so generous. 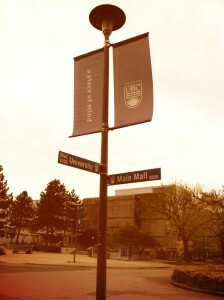 But you, UBC, are greedy. I wanted to stick with you. I knew that our core years together were over, but I couldn’t leave you. I wanted to take a night course. Just one course, at a reasonable cost. Imagine my confusion (no, shock. No, anger and disbelief) when my tuition fees were more than double the advertised cost of the course. This year, three arts faculty credits were to cost me $1100. That’s the same cost as an entire semester in my first year of our relationship. You were taking advantage of me, UBC. You thought that I loved you so much that your AMS Fees wouldn’t hurt, but they did. Each of the dollars I’ve given you returned back to make a paper cut on my heart when I realize that I never mattered to you. You only loved me for my money, bleeding me dry one tiny cut at a time.